Now control your music apps and effects without touching your device with the iRing™ touchless controller for iPhone, iPad and iPod touch. The new iRing uses hand gestures to control parameters of effects and other items in your music apps, allowing you to create stunning and dramatic music in an incredibly fun way by simply moving your hands in front of your device. 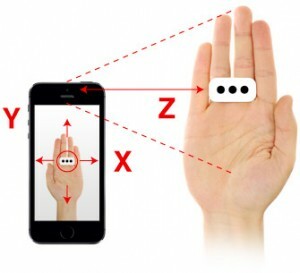 iRing uses patented advanced image-recognition, motion control and precise geometric positioning technology to give you control of assignable parameters within your apps. It uses the front-facing camera on your device to determine the exact position of the wearable rings, and recognizes and tracks the movement of the linear or triangular patterned iRing “rings” allowing you to control up to six parameters at a time. Making music and creating killer real time effects for nonstop dance music and grooves is now easy and as simple as moving your hands… something you probably already do. So get the groove going and take control with your hands and iRing. With iRing, you actually get a 3 dimensional grid — an XY and Z grid — that allows you to move across the screen to control delay time and feedback (the X & Y grid), but also gives you a third parameter to control by moving the iRing closer to or farther from the device. This “Z” movement allows you to control the amount of delay applied to the signal, so you can control up to 3 parameters at a time with just one iRing. 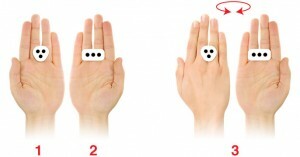 And iRing comes with 2 rings, one for each hand, so you can control up to six parameters (3 per effect) with your hands. iRing™ technology can easily be utilized beyond music apps, so we encourage game, health & fitness, utility and other app developers to contact us to take advantage of the technology and improve the functionality and control of apps with iRing™.